Website design construction companies Chesapeake VA | VISIONEFX designs websites for home builders, home contractors and remodel companies. 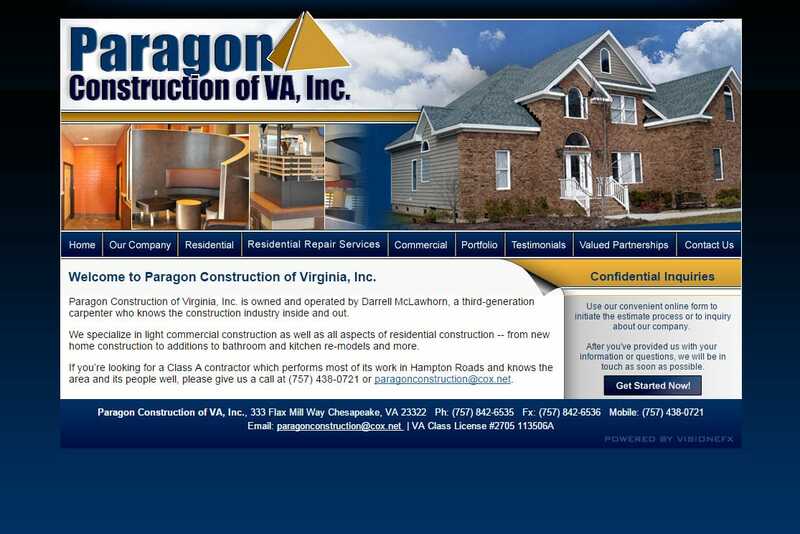 Paragon Construction specializes in light commercial construction, residential construction — from new home construction to additions to bathroom and kitchen re-models. When searching Web Design Chesapeake VA – Web developers Chesapeake look no further than the web design experts at VISIONEFX. VISIONEFX, a Web design company based in Virginia Beach, VA provides extraordinary web design for small and large businesses throughout the United States to include; custom web design, web development, e-commerce web design, Word Press web design, Joomla web development, SEO and web maintenance services. Call: (757) 619-6456 or email info@visionefx.net. For more information about web design chesapeake virginia contact here.